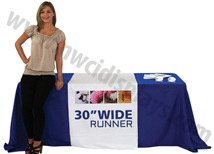 Trade show table throws will make any standard table look like a professional display area. 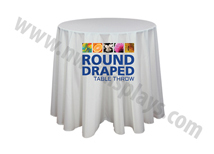 We offer many different styles and sizes so you can find the perfect fit for your presentation. 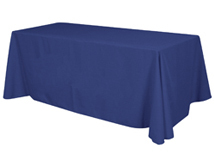 We offer everything from standard unimprinted table throws which are available in multiple colors to Ultrafit customized table throws that are full color and designed to make a standard table look custom. 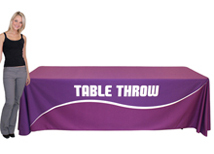 These table throws work great with any of our table top displays including table top pop up displays and portable table top displays. 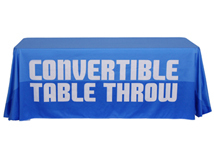 Table throws and table covers will work on any standard 6 or 8 foot table. 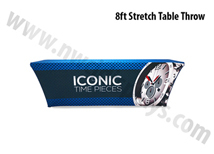 The full dye sub table throws utilize dye sublimation technology which creates a color and vibrant print that is durable enough to wash in a standard washing machine. 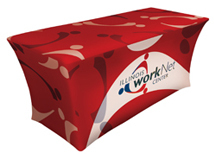 There are many other trade show accessories available that will make your trade show booth unique. 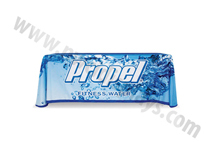 We even offer custom large format printing options for companies looking to re-brand their existing display. We can reprint graphics for any display brand, style, or size!